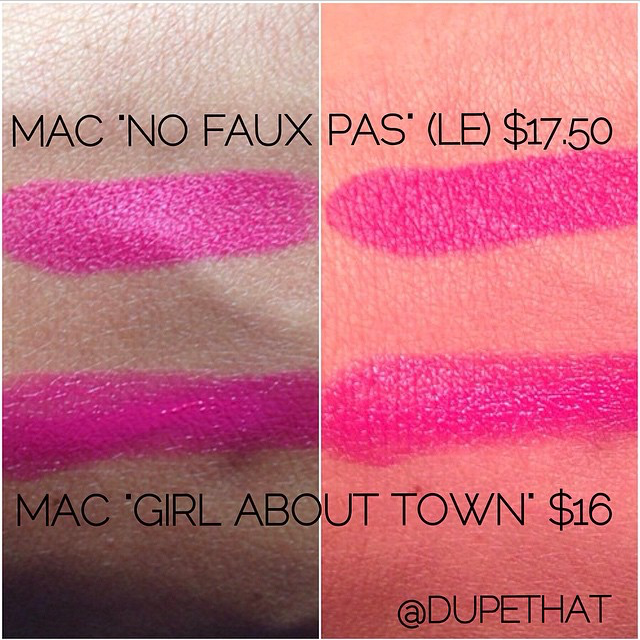 Here are swatches comparing MAC "Girl About Town" next to MAC "No Faux Pas" (LE) from the Heirloom Mix collection. They differ in finish. Prices listed on photo. Thank you @tesladoll on Instagram for sharing these swatches with us. Here are swatches comparing MAC "Girl About Town" next to some other similar colors, including MAC "Lickable," "Full Fuchsia," and "Hollywood Cerise." Prices listed on photo. The left photo was taken outside without flash while the right photo was taken outside with flash. Here are swatches comparing MAC "Girl About Town" next to Rimmel London Moisture Renew lipstick in "Funtime Fuchsia." Prices listed on photo. Thank you @sophie_evans_ on Instagram for sharing these photos with us. To see more dupes for MAC "No Faux Pas," which would also be considered dupes for MAC "Girl About Town," click here! To see more dupes for MAC "Hollywood Cerise," which would also be considered dupes for MAC "Girl About Town," click here! To see more dupes for MAC "Full Fuchsia," which would also be considered dupes for MAC "Girl About Town," click here! To see more dupes for MAC "Lickable," which would also be considered dupes for MAC "Girl About Town," click here!